This is a collection of quick and easy Apple related tips. Both for Computers and handheld devices such as iPhone, iPad etc. Time machine slow for you? Speed up the initial backup with the following command and run it in a terminal window. 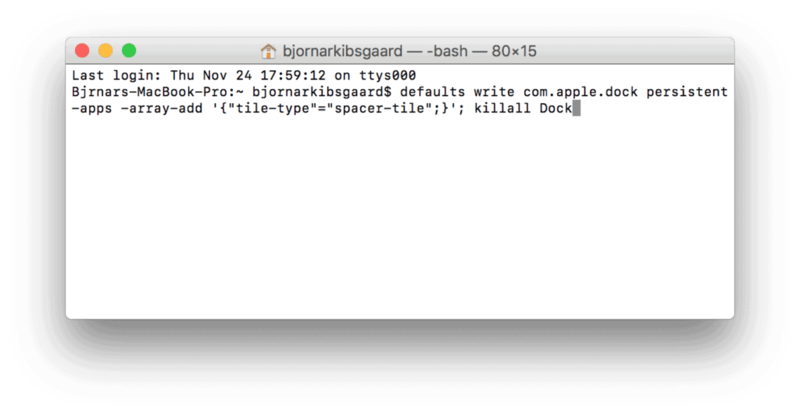 To open up terminal just search for it using spotlight and start it. When you enter the commands above you will be asked for your password. It is the same password you use when logging in to your Mac or installing new applications. It won’t show the password when you are typing it. The reason for time machines initial backup being slow is that it defaults to a low priority mode. When you enter the command above it will increase the priority with the cost of using up more resources from your Mac. The benefit here is that the initial backup will go much faster, and I would certainly welcome that over some more power savings. When you are done, just remember to return to the default mode, if not your machine may feel slow because not only time machine but other background tasks are affected by this command as well. When the initial backup is done it should be no big issues with the backups after that. In most cases it is the initial backup that makes time machine run slow. Most people just leave it on overnight and it takes care of itself, but if you are in a hurry the suggestions in this article should help. Are you backing up via WiFi? That can slow down backups. Make sure you are close to your access point / router or use a physical network cable to connect your Mac directly to the router. Format or check the hard drive you are backing up to. Open up disk utility and run a check on your hard drive. Maybe the drive is getting bad, or a repartition and a reformat could help. If you have cancelled or unexpectedly interrupted the previous backup time machine may take a longer time when making a new backup again. If you are running antivirus try disabling it during the backup as it may slow it down. Virtualization apps like Vmware Fusion or Parallels can often write data to your hard drive and this may keep time machine going all the time. Consider excluding virtual machines from your backup. They are organised into folders, first year and then event. 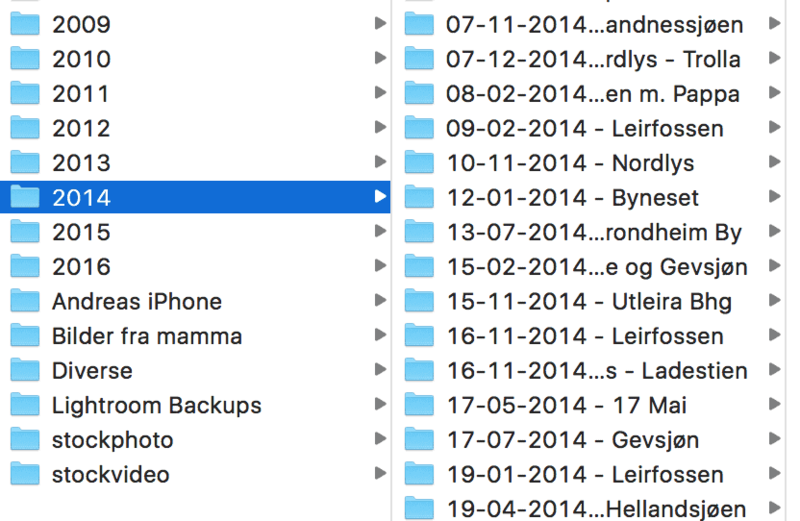 If you wanted to import this folder structure into Apple Photos it would require a lot of manual work. Especially if you have tens of thousands of photos. Doing manual work is stupid, that is why we made computers in the first place and a guy calling himself code!z have created a neat AppleScript that makes this process automatic. What you do is download the script you find here: ImportPhotoFolders. 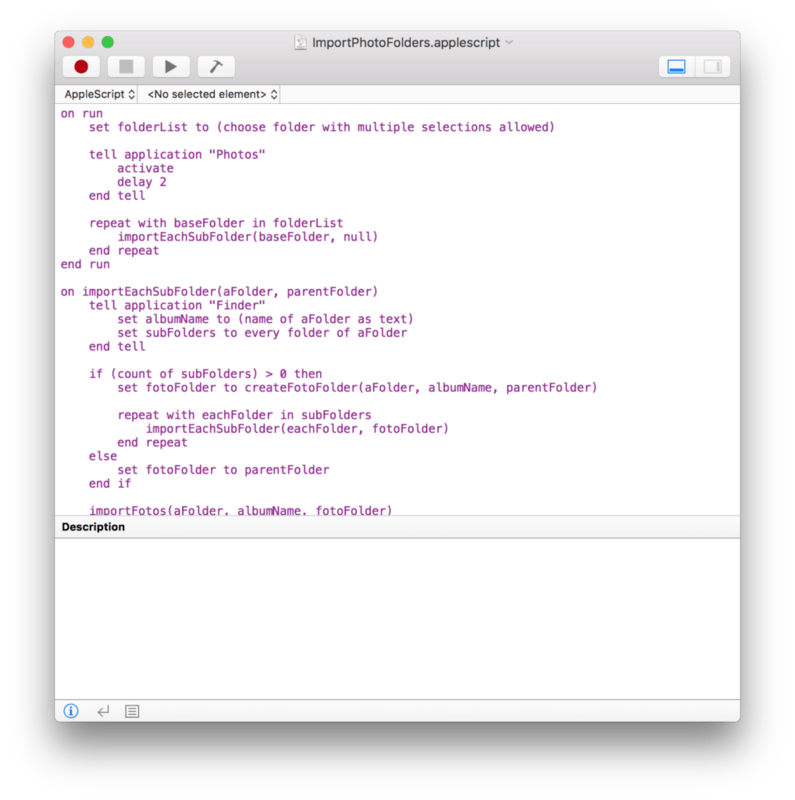 Find the ImportPhotoFolders.applescript and double click on it. You will get a window looking like the one below. Press the “Play” button and a file selection window should appear. Navigate to the folder you would like to import and let the script do its magic. It will now import all those files into Photos making a folder of the root directory and albums from the folders inside the root directory. A very neat and free script to use if you want Apple Photos to handle all of your photos but still want to retain your directory structure. I recommend to make a small selection first, to see if everything works like it should. When you have a new system to set up there are always some applications you want to get installed and set up. Maybe you use another web browser, need dropbox, OpenOffice, Skype or other applications. Windows users have a free service called ninite, but is it available for Mac users? Not exactly, but you have something called: Get Mac Apps. The point of this is to click the apps you want to install and it will automatically get the newest version of all apps you want and give it to you in one convenient download. Of course you could go to each website and download it, but this way you dont have to visit each website and download one app at a time. Also take a look at SetApp: Best Apps for Mac, Yours to Explore. It is a subscription service that gives you access to a lot of great Mac apps and its free to try out. To add a spacer to your Macs dock so that you can organise the icons a little better you just have to right click the dock and select add…. nope, sorry. Did you think it was so easy? The dock should briefly disappear then appear again with a spacer you can drag wherever you want, like a normal icon. If you want more spacers you just run the same command above again. If you are finished in the terminal type exit and the window will close. If you want to remove the spacer, just drag it off the dock as you would do when removing another icon. With the release of the MacBook Pro in 2016 Apple also decided that the classic startup chime from 1999 had to go. If you are dealing with grief due to this know that it is possible to restore it again! You just have to do some typing in the terminal. You dont need third party software to create a PDF file from something you want to print. This functionality is built into macOS. If you have a document, website or something similar you want a PDF file from just go to File->Print. (Or CMD+P). In the print window that appears you should be able to save it as PDF. Having a printer installed is not necessary to get this working. 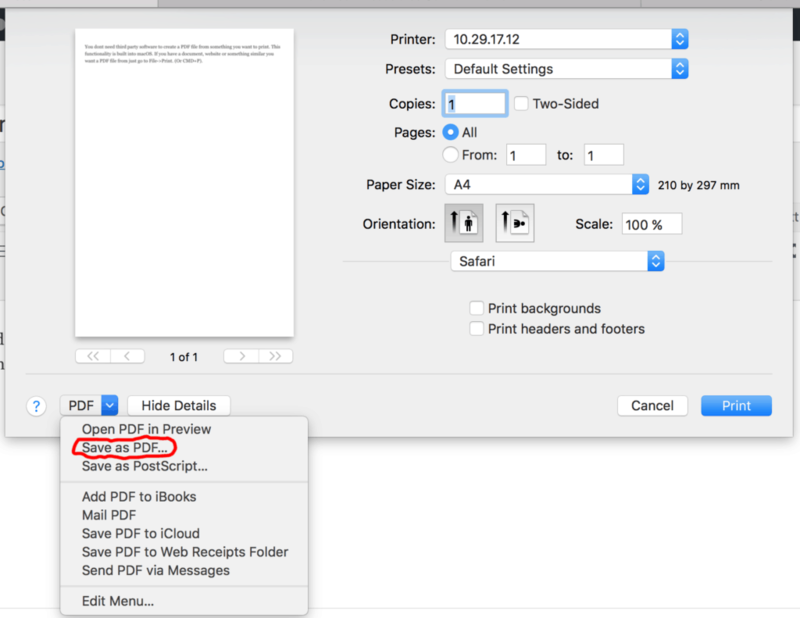 In other applications (like Numbers) you may have to go to File->Export to get a PDF file. This vill vary depending on application you use. Lowest Mac Volume Still Too Loud? Did you know you can lower the volume on your Mac even more? Without making it completely silent? If you hold the shift and alt key while pressing the volume adjust key it will decrease/increase the audio by ¼ step instead. If you want to maximise your window in macOS a quick way without having to enter fullscreen you hold down the alt button and click the green button. If you hold the cursor above the green button and press alt at the same time you will see that it changes to a plus sign. When you see the plus sign click the button and the window size will increase so the content inside fits.